Welcome to Marty Bernard's Railroad Picture Archives! Welcome to the RRPictureArchives.NET contributor site of Marty Bernard. 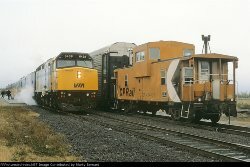 I have been shooting train pictures since the early 1960s and have posted them here for railfans and railroad researchers to see. If you see an interesting picture, or one that brings back memories, or have a question, or if you find an error in the photo data, please leave a comment in the area at the bottom of the picture and it will automatically get to me. I appreciate your comments and feedback. Thanks. Enjoy.